Yuri Mitzkewich, one of Vegan Outreach’s most dedicated Adopt a College volunteers, has traveled to 18 different schools this semester, handing out over 15,000 booklets! Since the fall of 2010, Yuri has placed VO booklets into the hands of more than 55,000 people! 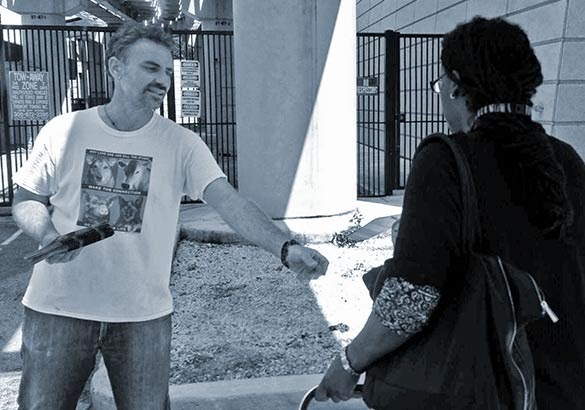 Yuri hands out VO booklets at the Miami Dade College Wolfson Campus, where Crystal Silva and Janay Laing joined him for their first time leafleting on 3/12/14, and the three reached 1,200 students – a new one-day record for the campus! “Wonderful team outreach today down in South Florida! Met several vegetarians and vegans there; also got several shout-outs from students and staff giving us props for coming out. [Below] is a photo of Taylor, who told Janay she went vegan after getting a Compassionate Choices booklet last semester at BC. She says she then wrote a paper on veganism for her class and earned an A+ from her teacher, and even inspired her girlfriend to go vegan! Linda talked with her awhile too, and also said how thankful and excited she was seeing us back on campus. on campus last semester and went vegan as a result! “I also met a student named Pamela, who came walking back to talk after taking her Your Choice. She asked if the booklet’s purpose was to promote animal welfare improvements or if we were for ending the use of animals for food for good. I told her I was for the second; but also said how, for many, this is a transition and it’s perfectly acceptable to work towards it step by step. She left saying how she agreed with what I’d said, and was going to begin right away by not eating chicken or eggs anymore. A very positive interaction I’m very sure will lead to more changes for her in the future. Please click here to visit Yuri’s Team Vegan page and have your donation doubled today!